PORK is a much safer White Meat than CHICKEN! 36% of UK population take oral antibiotics each year! ...Higher Antibiotic Resistance Risk than eating Meat! POST-WEANING DISEASE CONTROL: A UK PERSPECTIVE! Antibiotic Resistance: MYTHS AND REALITIES! An Email when these discount Food Safety - Pork Quality Videos & Books Updated? Download the Meat & Poultry Safety Brochure referred to in this video: www.meatmattersinfo.org [an overview of the food safety practices used by the U.S. meat & poultry industry & USDA federal meat inspection. Latest in the popular series of Meat Inspection Handbooks (U.K. Canada USA). Richly illustrated, condensed guide to inspection of pork and manufacturing pig carcasses at the abbatoir for disease conditions that require partial or total condemnation of the meat. The full colour photographs make this Meat Inspector's manual into a "recognize disease conditions" atlas that is easy to use for untrained people e.g. hunters and home-butchery enthusiasts, as well as official veterinary surgeons (OVS in the EU) and meat inspectors in public abattoir hygiene service. Basic instructions in porcine anatomy, disease and food-safety-related matters is included. The book is useful for wild, abattoir or home-killed meat consumers. This pocket textbook is also useful for hog-breeders and rearers who want to interpret abbatoir condemnation data or simply get an idea what a sow, boar or grower may have died of. * Anatomy & physiology of pigs * Diseases of swine * Parasites of pigs & pigmeat * Neoplasia * Affections of specific carcase parts * Disease and cause * Conditions encountered at post mortem inspection * Anatomy � aide memoires * Index of autopsy Disease Conditions and causes listed by Organ Affected (trachea, uterus, lymph nodes, mammary glands, muscles, skin, lungs, feet, fetus, head, heart, pluck, joint lesions, intestinal pathology). 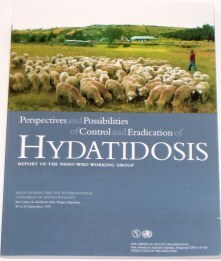 "Perspectives and Possibilities of Control and Eradication of Hydatidosis"
"Handbook of Organic Food Processing and Production"